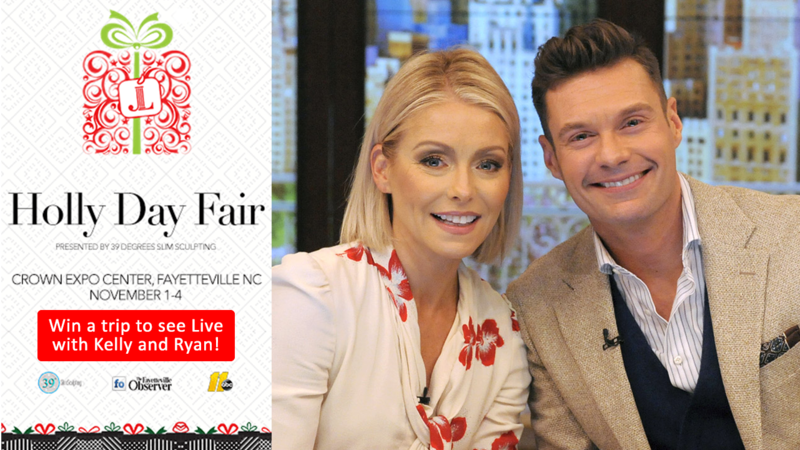 Sponsored by the Junior League of Fayetteville Holly Day Fair: Live with Kelly and Ryan In-Studio Audience Sweepstakes for a chance to win big! One winner will win airfare, a hotel night, and tickets for two to see the Live with Kelly and Ryan show in New York City! Visit https://abc11.tv/2ymSFmd, verify you are an adult, check the "I accept the terms and conditions" box, and then click to submit. The contest runs October 22, 2018 - October 28, 2018, at 11:59 pm. Winners will be notified on or around noon on October 29, 2018.